When you need to mount a small camera from the framing of a suspended drop ceiling- the ALZO Suspended Drop Ceiling Upright Camera Mount is the perfect solution. This metal bracket and ceiling frame clip easily attaches to 1 in. wide metal T-Bar framing and can be easily moved. The bracket attaches to the pin on the clip and can be easily removed from it. The kit includes a piece of safety line- and we strongly recommend using this line to physically attach the camera to the ceiling framing for added security. 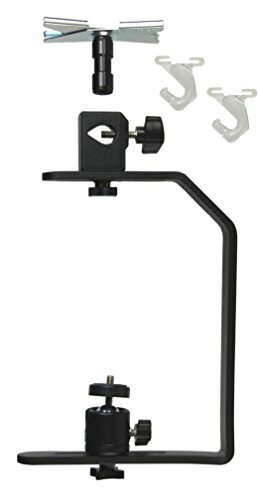 The kit also includes 2 plastic T-Bar hooks that attach to the ceiling framing and provide a simple cable management for the cords that connect to the camera.